If you live in the UK and love cars you simply must visit the Goodwood Festival of Speed. 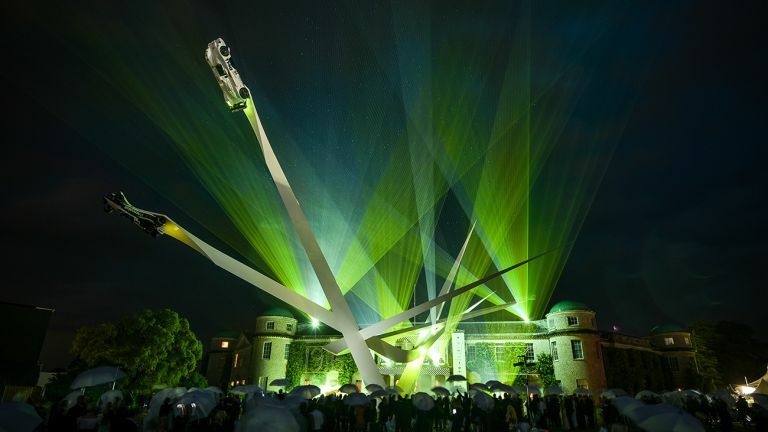 Every year hordes of enthusiasts descend upon Lord March's front lawn to celebrate everything automotive, from screaming F1 cars to a selection of fine leather driving gloves - Goodwood FoS caters to everyone's tastes. T3 has had a good root around the festival, and these are things we think you must check out. Not only is the Festival of Speed a chance to see adrenaline-fuelled race cars - it's also the UK's leading motor show - usually the first chance for punters to see new cars in the metal. Aston Martin Vantage GT12 Roadster is a one-off commission designed and made by “Q by Aston Martin”, the company's bespoke service. The GT12 Roadster takes the Vantage GT12 Coupe's extreme ethos, and adds “the visceral thrill of open-top driving”. Under the hood is a 595 bhp naturally aspirated 6.0-litre V12, and the same seven-speed Sportshift III automatic gearbox. We drove it the Jaguar F-Type SVR in Spain a few weeks ago, and now you can take a look at it in the metal for the first time in the UK. Well worth checking out. The Mercedes AMG GT R has made its worldwide debut at Goodwood this year. The 4.0-litre V8 has been tuned to produce 577, enabling a 0-62mph time of 3.6 seconds. There's also aerodynamic improvements and an exclusive colour, named 'AMG Green Hell Magno'. The 2016 Festival of Speed is also the first time you'll be able to view the striking new Lexus LC 500. Packing a 5.0-litre V8 pumping out 467 hp, the Lexus will sprint from 0-62 mph in 4.3 seconds and it comes filled with a load of technology as standard. The Mini John Cooper Works Challenge is a limited edition is designed to deliver “maximum track ability and on-road driving thrills”. It looks great with added aero tweaks and comes with adjustable Nitron suspension, bigger Mintex brakes, a Quaife limited-slip differential and lightweight alloy wheels by Team Dynamics. Other highlights include the Bugatti Chiron which we saw earlier in the year at Geneva Motor Show, the sportier Ford Fiesta ST200, Maserati Levante, Mazda MX-5 RF, the new Nissan GT-R which we've driven and loved, and the Tesla Model X. There are lots of fun stands at Goodwood this year, but taking the crown for “T3's Best Most Fun Stand at Goodwood in 2016” is Ford. The stand features a diving platform and giant air-filled landing bag. Other stand highlights include Honda, which resembles a giant Fisher Price toy, and Vauxhall, which has a crazy-football-golf course... through cars. Jaguar Land Rover has unveiled its biggest presence ever at the Festival of Speed, and it's packed with fun for the whole family. You can be whipped around in a snarling Jaguar F-Type, or experience the extreme off-road capabilities of a Land Rover. There are remote control cars for the little-uns, and, if you're a Land Rover or Jaguar owner you can have a coffee in the exclusive upstairs area. Of course, there's also a tonne of cars to look around, and a little section devoted to Land Rover Ben Ainslie Racing and Wimbledon. Also - great stand to buy an umbrella at if the heavens open. You really could spend all day here. Okay, so you're a little late for this one, but next year you should definitely get down to Goodwood on Thursday and take part in the Moving Motor Show. This is where you can sign up to drive the famous hill climb (a quick sprint up Lord March's driveway). We did one in the impressive 5.0-litre V8 powered Lexus RC F. The best thing about it was the enthusiastic driving instructor who was actively encouraging us to drive faster. Get up close and personal with no fewer than seven F1 teams. There's nowhere in the world (other than a Grand Prix circuit) where you can see so many of these impressive machines in one place, and thanks to a distinct lack of stressed engineers running around, Goodwood is a lot more enjoyable. Some of the best drivers in the world will be driving up the hill over the next three days. You can find a timetable on Goodwood's website. The big names include Ken Block, Jenson Button, Lewis Hamilton, Sir Stirling Moss, Emanuele Pirro, Nico Rosberg, and Sir Jackie Stewart. The Festival of Speed isn't just about new cars, there's also the Cartier Style et Luxe lawn which hosts some of the rarest and most beautiful cars in existence. Some of the highlights include a menacingly angular Meyrignac A110 Coupe, a rare Le Marquis Prototype, and imposing Rolls-Royce Phantom III Gurney Nutting Sports Saloon. Take a break from all the cars by going to check out TAG Heuer's new watch. The limited edition timepiece pays tribute to legendary racer James Hunt, and features the distinctive stripes found on Hunt's racing kit. It's available with a nylon or steel strap, priced at £1,150 and £1,300 respectively, and located at TAG's pavilion near the F1 Paddock, surrounded by a number of cars, including James Hunt's Lotus 59 and the Red Bull Racing TAG Heuer RB12.